To Sum It Up: Following the assassination of her father by her uncle, fifteen-year-old Laila, along with her mother and younger brother, suddenly finds herself adapting to a new life in the United States. Not only must she grapple with a complete change in cultures, but for the first time, Laila gets a hard look at the perception of her father outside of her homeland. As she struggles to cope with everything that’s happened, her mother pursues her own agenda—one that involves making deals with the CIA. Review: I rarely read current events-related books, but I couldn’t help being intrigued by the synopsis for The Tyrant’s Daughter. The fact that the author is a former CIA officer also piqued my interest in a title that otherwise would not have caught my eye. The expectations that I formed in my head based on the blurb and the author’s background didn’t quite line up with how the story actually played out, though. The narrative is told from the perspective of fifteen-year-old Laila, who was until very recently a princess, the daughter of the ruler of a Middle Eastern country that is never named. Laila’s royal world came crashing down the day her uncle killed her father and seized power. Laila, her mother, and little brother, Bastien, have fled to America, where the family is living in drastically reduced circumstances. Although Laila comes across as a fairly sympathetic character who’s caught between her past and present lives, I found her narrative voice detached for the most part. I couldn’t muster much emotional investment in her story, not because there was anything blatantly wrong with the prose, but it just didn’t jump off the page at me. I read a little too much into the part of the book’s summary that references Laila’s mother, Yasmin, negotiating with the CIA to put her son on the throne. I was hoping to see the author’s personal experience with the agency lend a unique angle to the novel, but the events in the book don’t venture too far from what you’d find in a collection of news stories. Yasmin does engage in some slick maneuvering to get what she wants, but the results, while not completely lacking surprise, aren’t exactly jaw-dropping, either. There’s also a bit of an info dump toward the end of the book. 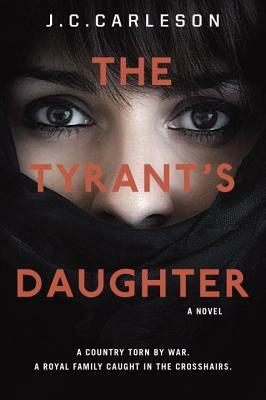 This review has been a challenge to write because although I didn’t have any particularly salient issues with The Tyrant’s Daughter, it also wasn’t a page-turner for me. It’s equally difficult to rate this type of book, where you’re not really leaning toward liking it or disliking it. My rating reflects being unable to get into the story more than anything, so if this sounds like a book that interests you, I urge you to give it a read for yourself. All in All: The Tyrant’s Daughter features a fairly fresh premise among YA contemporary novels, and that alone may make this worth checking out. Unfortunately, the book didn’t work out for me, but then books in this genre tend to be hit or miss for me.